LOS ANGELES (Ticker) -- It was a low day for high seeds at the $525,000 Countrywide Classic. Top-seeded Fernando Gonzalez of Chile was stunned by American Zack Fleishman, 7-6,(7-5), 6-4, in first-round play Tuesday night. Gonzalez's ouster came just hours after fourth-seeded David Nalbandian of Argentina was jolted by unseeded Igor Kunitsyn, 7-6 (7-5), 7-5, in his opening-round match. Fleishman, playing in just his fourth ATP Tour match of the season, broke Gonzalez in the eighth game of the first set for a 5-3 lead, only to see the world's No. 6 break right back and eventually force a tiebreaker. Gonzalez, who was a semifinalist here a year ago and reached the finals at Rome and the Australian Open in 2007, could not carry the momentum into the tiebreaker. Ranked No. 162 in the world, the unseeded American overcame an early 1-0 deficit in the second set to post just his second ATP win of the year. Fleishman will face countryman Robert Kendrick in the second round. Nalbandian's debut in this event was equally forgettable. Ranked 24th in the world, Nalbandian had his serve broken five times by the 25-year-old Russian and won just 10-of-28 second serves. Kunitsyn, who is ranked 99th in the world and has a 23-41 career singles record, advances to face Germany's Nicolas Kiefer, who won his opening-round match on Monday. Kiefer, who is trying to bounce back from wrist surgery last July, won the only meeting between the two players in 2005 at Moscow. Second seed James Blake of the United States moved on with a 7-5, 6-4, win over Austria's Alexander Peya. He will face countryman Paul Goldstein, who also advanced on Tuesday. 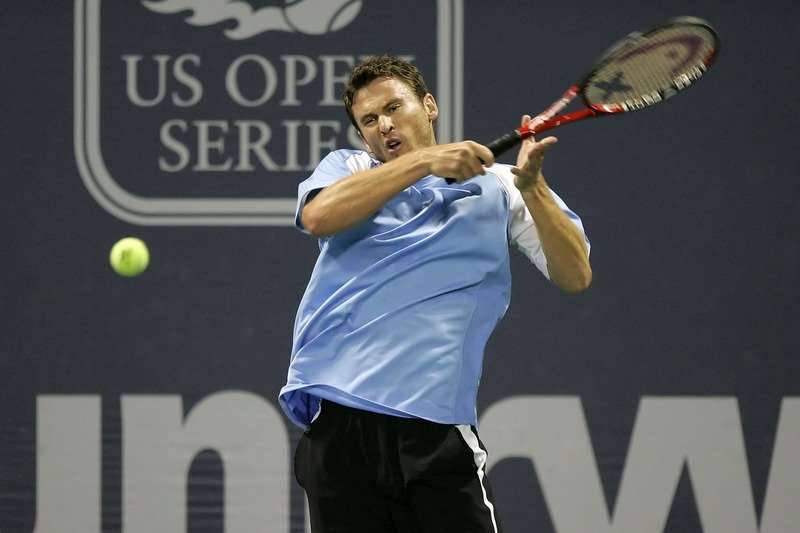 Sixth-seeded Mardy Fish advanced with a 7-5, 6-4, victory over fellow American Sam Querrey. Fish, who has yet to reach a singles final this season, will face Radek Stepanek of the Czech Republic in the second round. Stepanek advanced when Alex Bogdanovic of Great Britain retired after losing the first set, 6-1. Stepanek is coming off his best tournament of the year, reaching the semifinals at Gstaad, Switzerland a week ago. Other first-round winners on Tuesday were Vincent Spadea of America, Ricardo Mello of Brazil, Wesley Moodie of Russia and Switzerland's George Bastl.